Sing With Us - Nanaimo Youth Choir, Nanaimo, B.C. 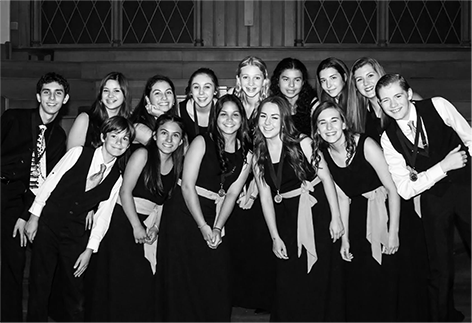 Nanaimo Youth Choirs are comprised of the Junior Choir (ages 5 to 10) and the Concert Choir (ages 11 to 19). The choirs sing in and around the community and have traveled to festivals and choral workshops in B.C., Alberta and Oregon. The Nanaimo Youth Choir presents concerts in December and June, in addition to an annual concert for schools at the Port Theatre. The Junior Youth Choir practices are held at 375 Selby Street in Nanaimo on Wednesdays from 3:30 to 5:15 pm. The Concert Choir practices at St. Andrew’s United Church on the corner of Fitzwilliam and Wesley Street on Tuesdays from 3:30 to 5:45pm and also on many Fridays from 2:30 to 4:30 p.m. If you are interested in participating or joining in, please contact director Marian Smith at (250) 741-6998 or email her at for more information on how to join. Annual fees for the choirs are $500 for the Junior Youth Choir and $600 for the Concert Choir.